Public speaking is arguably the number one phobia/fear in the world. It is no joke that,at a funeral, most people would rather be in the coffin that have to deliver a eulogy/funeral speech. Simply put - most people fear public speaking more than they do death. It would be funny if it wasn't so sad. Whether it's a sad occassion or a happy one, nervousness is always the number one hindrance. With a funeral, however, there is a lot of emotions involved and a real fear of possibly saying all the wrong things and hurting people even more. It goes without saying that a EULOGY/FUNERAL SPEECH is very challenging to put together. It is a daunting task since any person giving a speech at a funeral needs to be sensitive, and as comforting as possible to the bereaved family. "A Eulogy To Remember" helps you Write Great Eulogies - With Samples, Poems, Quotes.EMOTIONAL/SAD SPEECHES! * You have to pull yourself together and try not to be overwhelmed with emotions. Seek counselling if you have to but do stay strong if you are to speak. * Do a tribute to the deceased - a poem is good too. Speak truthfully but never be brutally honest. Every person has good qualities and do refer to those and how they have touched your life; how you shared special moments together and how the person will be missed. 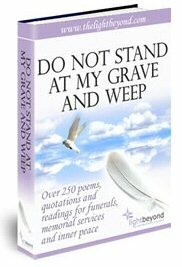 * Get a good book on bereavement and do take out some comforting words/lines from it. Relevant Bible verses are a great resource too - but be careful if the bereaved family are not Christians or religious. TROUBLE REMEMBERING NAMES AND NUMBERS?